Will L.A. Shut Down Food Truck for Homeless? Will Food Truck for Homeless, Previously Evicted by WeHo, be Shut Down by L.A.? Residents who live near the distribution site for the Greater West Hollywood Food Coalition say that the organization’s clients create problems in the neighborhood. Previously evicted from West Hollywood, the very city that created it, the Greater West Hollywood Food Coalition (GWHFC) could now face the prospect of being shut down by the city of Los Angeles. An L.A. City Council subcommittee meeting at 2 p.m. today is scheduled to consider a motion about “non-commercial meal distribution in the public rights of way.” That’s a category that includes GWHFC, which each night parks its food truck at Sycamore Avenue and Romaine Street, just east of West Hollywood, and serves meals to the needy. GWHFC specifically has generated complaints from people who live near its distribution site. Some area residents say that clients of the GWHFC truck have left syringes, drugs and human waste in their trash and in their bushes, CBS L.A. reported. Ted Landreth, one of the founders of GWHFC, said that the organization has always been willing to talk to neighbors about their complaints, and to try to figure out if the people creating problems are clients. It’s a mistake, he said, to paint all homeless people with the same brush. He criticized the neighbors for taking what he called the “political position” that getting rid of GWHFC is the only way to address the complaints. The motion introduced by LaBonge proposes that the city attorney “provide legislative options” and “draft legislation” to address problems associated with the distribution of food on public right of ways. Correction: A previous version of this story incorrectly stated that the LA City Council is meeting today at 2 p.m. to discuss the homeless coalition. It is the Public Works and Gang Reduction committee that is meeting. How Does WeHo Compare with Neighboring Communities in Rush Hour Traffic? Ted Landreth is perpetually playing the victim. He goes on and on and on about neighbors, business owners, etc wanting gwhfc stopped. Quite the contrary! We, as well as those interviewed IN THE LINE ITSELF, stated that they would like the opportunity to move INDOORS where they would have a proper place to wash up, use the restrooms, and sit down to eat, instead of at a filthy curbside. But despite this FACT Ted REFUSES to move indoors when, over the years, various locations have been found for the food line. Something is very, very wrong when ted himself who claims to ‘help people’ will not listen to those he ‘serves’ and agree to move indoors. Snarkygirl: Mr. Landreth is rarely down there anymore. He’ll tell you as much. And even when he is he’s there he’s only there for 2 hours of the day not the rest of the 22 hours to “manage” the people who get out of line. Plus he is not a warlord. Anyone in the neighborhood knows we’re all compassionate towards people and especially the homeless. It’s about finding a solution rather than this drive by humanitariasm. 2 hours of the day they come in and draw some unsavory figures. (It’s a fact, check with the police who are assigned to the area.) We want to help these people we do more than just this 2 hours a day. And Mr. Landreth is happy to stay at my place for a month to see what the other 22 hours of my day is like. It’s a lot different than his home in Carthay Circle. Such lack of compassion makes me ashamed for us all! THE answer here is to find a INDOOR place with bathroom facilities to accommodate this situation. The downtown LA MIssion seems to have a little bit better grip on how to deal with the homeless situation. Personally these folks should be given some “life skills” to try to get them off the streets. We are the richest nation on the planet and have the largest per capita homeless in the world! WHY is that? How about some job training skills classes? Instead of just feeding them, try to HELP them as a total person! More help from places like Goodwill Industries and the Salvation Army. WehoGuy – I have a problem with a few things you said. First of all ” I gave up trying to work with him when I sensed that his motives were not so much helping the homeless as it was trying to annoy and control the neighborhood.” You SENSED his motives? He wouldn’t be there day after day feeding these people if he didn’t want to help the homeless. If you SENSED any other motive, it is on you. I don’t think for one second that annoying and controlling the neighborhood is on anyone’s mind but yours. Secondly, “they store their belongings in unlocked garages” – that is nobody’s fault but the owner of these so-called unlocked garages. If people locked their garages, the homeless would not be storing anything in them. Third, “These people are forced to lay in the gutters” – who is forcing them to lay in the gutter? Not to mention your comment about crossing the street. So what? They have to cross the street. People cross the street all the time. The homeless have no greater risk than anybody else of being hit. All in all, it sounds like YOU have a problem with the homeless feeding program being there. It doesn’t sound like you tried to work with Mr. Landreth at all. It sounds like you talked to him once and you didn’t like his response so you gave up and rail against him now. Why don’t you come clean and just admit that you don’t like having homeless in your area. I live on the east side of WeHo also. I met with Mr. Landreth 4 years ago to voice my serious concerns about the major problems many (not all) of his customers are causing on the east side of West Hollywood. His response was vague, flippant and condescending. No action was ever taken despite me sharing photos of some people who were consistently causing problems. I gave up trying to work with him when I sensed that his motives were not so much helping the homeless as it was trying to annoy and control the neighborhood. While hopefully well intentioned, GWHFC is the single largest cause of neighborhood safety issues. 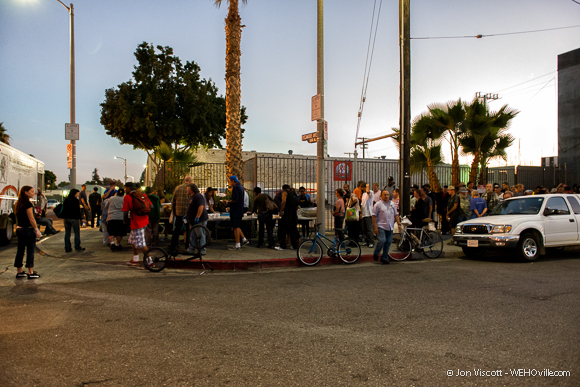 Beginning at about 4pm every single day, dozens of homeless men and woman begin the slow parade to the food truck. Their route leads them down Formosa, Detroit and La Brea. They relieve themselves publicly, they trespass on private property, they store their belongings in unlocked garages and they do drugs. At about 8pm, it happens again as they leave the area. Mr. Landreth who lives safely in Carthay Square doesn’t care in the least bit about the neighborhood. I encourage people to visit this site and see the filthy conditions and very unsafe process for serving food. These people are forced to lay in the gutters and walk across the street where they risk being hit. Find a suitable INDOOR location with bathrooms, showers, a real kitchen. If Mr. Landreth really cared, he’d treat these people with more respect.